Discussion in 'Transformers Fan Art' started by Kthardin, Jul 20, 2005. 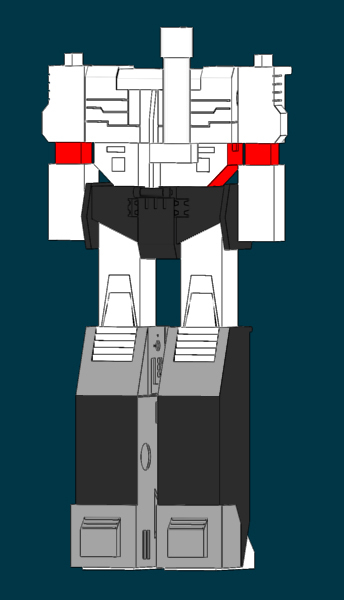 At the moment I'm going for more of the animated look (hence the Cell shading and rudimentary, if any, joints) with the eventual goal of making a possible fanimation reminicent of the original G1 series. So, how does he look so far? When I was doing Optimus Prime, the hardest part was certainly his hands. In the series, they are little more than human hands with lines drawn on the areas that signify joints for the most part. This didn't quite compute when I was making them, and since then I've been trying to figure out how to make a more robotic looking hand that incorporated elements of both the humanoid looking hands and the mechanical hands that most artists are using in their works presently. The biggest problem was the opposable thumbs and how it relates to the rest of the hand at rest and when it bends to touch the pinky finger (thus bending fully half the palm as well). Just tossing on a ball joint made the hand look bad, and every other kind of connection that I tried tended not to quite have the freedom of motion the thumb needs. Anyone else have these problems? And if so, how were they solved? It's a good start, but the proportions are a little off. the waist and thighs are a little too broad, the abdomin's pretty much alright but the upper body needs to be broader and taller. Funny, for some reason those are the complaints I see in many modeller's early work. Mine kind of had the opposite problem and ended up looking like they had chicken legs. Anyway, back to your work (and very nice colours and leg detailing, by the way) a few tweeks and it should look great. As for hands...well, I've had great difficulty with mine, so I don't know how much advice I can give. Mine are awkward and imperfect. If you can get hold of a Dreamwave comic, particularly More Than Meets the Eye issue #8, examine how artists draw the mechanism. Some of them give quite good pointers. I agree ahout the upper body being to "small". Other than that it's looking good so far, man. Keep us posted! As for the thumb joint, this is how I did it. The ball joint will be covered with armour when the hand is covered. I've been using footage from both the Transformers the Movie and the TV series for references, so I'll be certain to back and compare the upper torso and get a better fit for how he looked there. 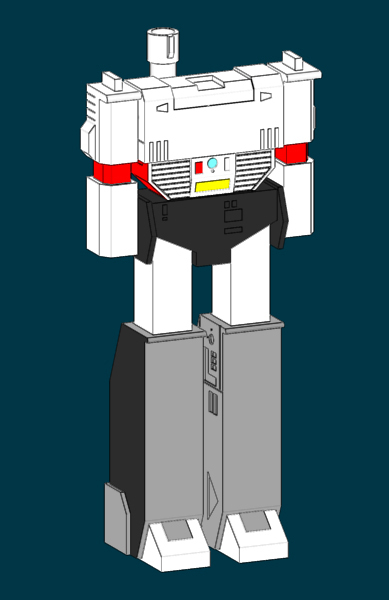 Though, that's a bit difficult as the animation of G1 was...imprecise...to put it mildly, heh. 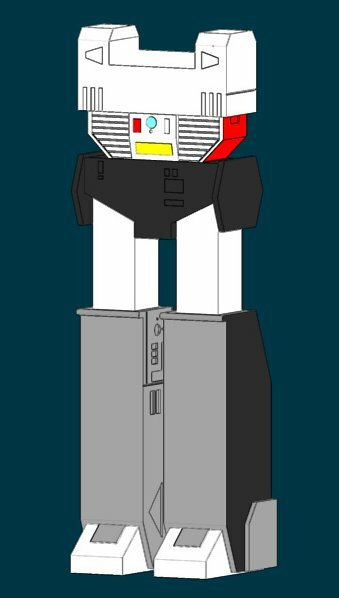 For example, did you know for the movie, the normally 'rounded' legs of Megatron were more squared off, like you see in my model? That was a tough call, deciding which version to use. I used the squared off ones, mostly because I thought they looked better. I've also been using Hasbro's 20th anniversary Optimus for cues on proportion. 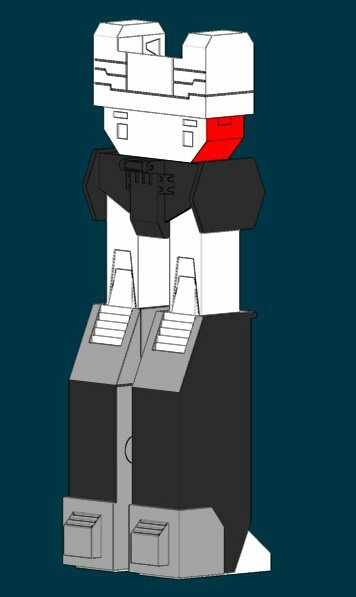 Given that Megatron is, at many points, proportionally identical to Prime in the cartoon, I may have been using him too much and made Megatron too identical to Prime's proportions...I'll be sure to look into it, especially in the upper torso area. Draven, when you cover his hands in armor, can you post pictures of it with the thumb both relaxed and opposed, palm up and palm down? I'd really like to see how the armor reacts and looks in those positions, if at all possible. Thanks be to both of you! Your best bet is to model all the individual parts accurately, then adjust the proportions as you see fit. When everything is made, you can tell when things are off. If I still have it on my HD, I'll see about posting some pics of how I did the hand for my seekers a while back. From what I see of your model, it's pretty decent for starting off at a beginner's level. One thing I have to recommend though, is that when building the robot mode, give them human-humanlike proportions. That said, the typical male is around eight heads tall with the knees at two heads tall, legs slightly above four heads, and torso going up to seven heads (that's including neck). This should help out. This is also why I've decided on simply keeping the bending straight edge joints in his hips and elbows. Admitedly they were simply shortcuts in the original cartoon, but with enough technobabble, one could come up with an explanation. In my case, if the flexible red covering (flex metal or memory metal if you will) were removed, you'd see Megatron's elbow joints. So, aside from that, how's he lookin'?